This morning, a group of soldiers waded into one of the innumerable parts of Srinagar where families are still being held hostage in their homes by several feet of water and heard a baby's cries. The seven-day-old infant was trapped on the top floor of a house with its young mother. A soldier made his way over; carefully, through an open window, he reached for the baby, bundled up in a white blanket. The baby was then passed on to another soldier, and slowly, carefully, the precious cargo was delivered to safety. "This is the rescue we are proudest of today,"said one the men. Nearly a week has passed since the skies split open over Jammu and Kashmir, unleashing a torrent of ferocious rain. Srinagar has been flooded since the weekend, when the River Jhelum, swollen by unusually heavy rain, imperiled the city of nearly one million people. Officials say one lakh ten thousand have been brought to safety by the National Disaster Response Force (NDRF) and the armed forces, who have shown limitless courage and initiative at a time when angry residents accuse the state administration of having failed them completely. It was a harrowing experience for the Gargs who had gone to Srinagar for a holiday. They were among 253 people who reached Chandigarh air force station in two different aircrafts. “We had no hope of surviving. It was the army who saved us. The local administration and police left us to fend for ourselves,” said Sushil Garg, 58, a resident of Sector 20, Panchkula. He runs a stationery shop in Sector-20 market. “We reached Srinagar on September 4. I went with my wife, daughter and son-in-law. We were staying at Regal Hotel at Lal Chowk. On September 5, there were heavy rains. But there was no alert from the local government. The next day water started flooding the hotel. In an effort to escape, we waded through the water with our luggage, and luckily reached on an elevated road,” he said. “Then, we took a taxi and shifted to Nishant hotel, which is situated on height and we thought it would be safe,” he said. Then someone told the Gargs that if they could reach near the Raj Bhawan, they could be evacuated to Chandigarh. They somehow reached the Raj Bhawan, but there were hordes of people. He said, “People were sleeping on roads, but there was no help from the state government. Children were hungry. We got a packed food item, which was from the central government. The local police was not intervening in the fights among the people standing in queues for evacuation,” he said. “My son-in-law and daughter are still in Sringar, but they will come in the next flight. I think those who have reached back are lucky,” he said. Mrs Pradhan smiled in relief as she settled in an Indian Air Force (IAF) helicopter after being winched up. Minutes earlier she dangled on the wire rope as her anxious children looked down from the chopper. The four-member Pradhan family was rescued in one of the countless sorties that the IAF and the Army have made to evacuate people out of flood-hit Srinagar. Mrs Pradhan said they had been stranded for four days. She thanked the soldiers who rescued her family profusely. 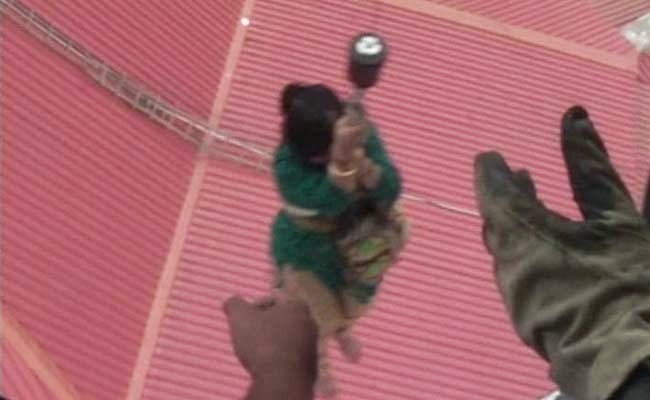 A camera on the helicopter that hovered over the red slanted roofs in Srinagar, captured images of more people trapped and waiting to be rescued. Among them a soldier who waved. He will be among the last to be brought out. The priority for the armed forces is to evacuate civilians. 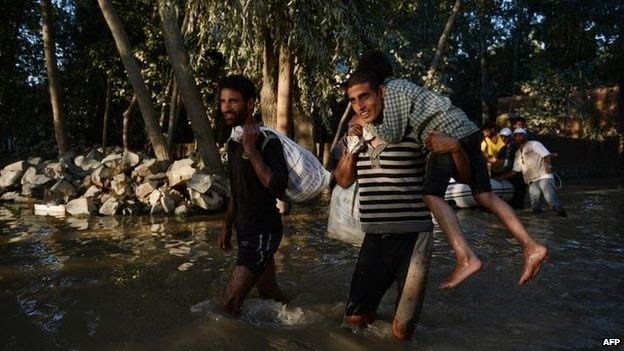 The armed forces and the National Disaster Response Force (NDRF) have rescued more than 76,000 people in Jammu and Kashmir, where heavy rain led to what Chief Minister Omar Abdullah described as the worst floods in a century. 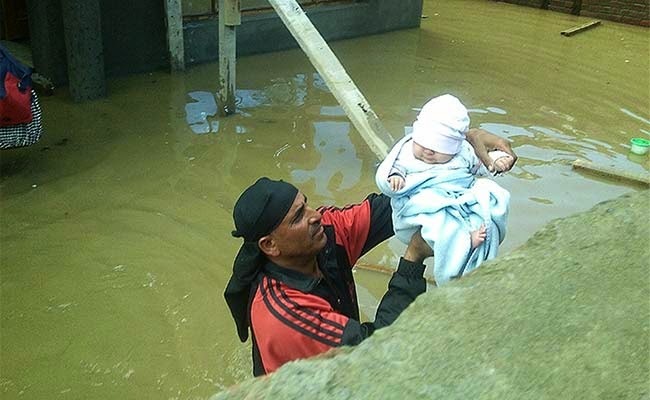 In flood-battered Jammu and Kashmir, the story of an infant just a few days old, saved by the army in a miraculous operation on the second day of the floods, has become one of hope – and despair. The baby was saved from the now deserted and desolate children's medical facility at GB Pant hospital in Srinagar, along with 300 other children. But doctors couldn't track down his parents. Today, he is nobody's child; no one knows his name or whether anyone will even come forward to claim the baby. "He will stay with us as long as possible," Brigadier NS Lamba, the army doctor, told NDTV. For now he is safe, but his future is uncertain. When the Army evacuated the hospital, the priority was to rescue babies and then women. Men were brought out last, so the Army is not sure whether this baby's father died as the waters enveloped the hospital, or whether he is stranded somewhere and alive. Mercifully, the infant is in good health, swaddled in orange and pink blankets, oblivious to the death and devastation from which he was brought out alive. The Army knows it cannot keep the child with them forever. Inside the hospital at the cantonment in the city's Badami Baghdad area, local Kashmiri doctors are helping Army doctors treat hundreds of children. 50 children are still not out of danger; ten of them are in critical condition. Almost a week after the floods hit, parts of the cantonment are still under water, and a 10 minute chopper ride from an old airfield is the only way to this area. Some children were flown in from the remote region of South Kashmir - an area worst hit by the floods. Among them is Anika, five, who has suffered breathing trouble and is trembling with pneumonia that doctors believe she has contracted in the floods. Her mother has not left her side for five days. Heartbroken and scared, she breaks down in a stream of helpless tears. "The child has contracted both encephalitis and pneumonia that we believe is because of the floods. She is having trouble breathing and has a serious respiratory disorder," said Squadron Leader Aneja, a doctor. On every bed, there is a little baby fighting to live. While thousands of migrant workers from Bihar and UP have gathered outside Srinagar's airport in a frantic rush to get out of the state, in the hospital, two women sit stoically in the ICU, knowing they must stay back for their children. Every bed in the hospital tells the story of a miracle rescue. A pregnant woman was flown in from Anantnag for an urgent delivery. Both baby and mother are well. Even when lives are saved, there may be no happy endings. Like a four-day-old baby, who waits for a family to call him their own. Nature's fury has been compounded by man-made carelessness to leave Kashmir's children the worst-hit. 5-year-old Abdul Rahman has been staying in a Gurudwara here along with his family ever since he was rescued from his house in marooned Wazir Bagh locality after the floods ravaged Srinagar. With temporary shelters being set up at gurudwaras and mosques for the victims, the calamity has bound people together cutting across religious lines. "We have been staying at Shaheed Bunga Gurudwara since Tuesday after some volunteers saved us from our house. We eat food at the 'langar' (community kitchen) hall and sleep in the main hall of the gurudwara," Rahman said. About 2000 rescued families of Sikhs, Muslims and Hindus have been staying at the gurudwara since past seven days. A few meters away from the gurudwara, a relief camp has been set up at a local mosque where around 500 families including, a large number of migrant laborers from various parts of the country, have been staying. "We adopted the concept of langar from our Sikh brothers and instead of giving dry ration we are serving pre-cooked food to the flood-affected people staying in the mosque," said Ghulam Qadir, a volunteer at the mosque. Many tourists, who got stuck in the Valley due to the floods and are now staying in the mosque, say they are overwhelmed with the love and care shown by the people of Kashmir. "Without enquiring about our identity or religion, people of Kashmir saved us. We are Hindu and are staying in a mosque where the local Muslims are taking our care. We now understand what Kashmir and Kashmiriyat is," Anil Kumar, a resident of Uttar Pradesh, said. Mehboob Ahmed, a volunteer at a local mosque at Barzulla Bagat area where several flood-hit victims have found shelter, said, "When the flood hit the Srinagar city, it did not distinguish between a Sikh family, a Muslim family, or a Hindu family. We all have been affected. Now we all are fighting this calamity as Kashmiris." Gurudwara committees from across the country have been sending relief material for the flood- affected people.